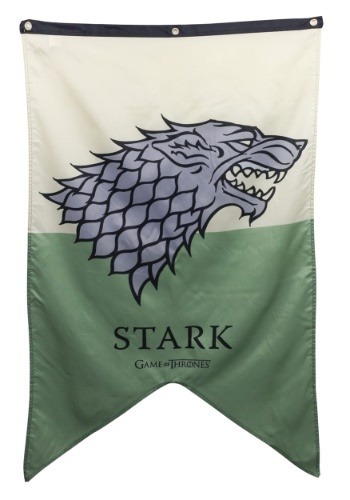 Printed sigil and "STARK - GAME OF THRONES"
Rally the realm! If you're having a Game of Thrones costume throwdown, there's really not any excuse for not having some decor to set the scene. And while you're probably not quite ready to turn your apartment into a room from the famed castle of Winterfell, there are a few signature touches you can add to make sure you set the mood to feeling like the North of Westeros. Like by flying this signature Game of Thrones Stark banner! Styled just like a standard that would be hanging in their ancient castle, this banner is sure to set the scene for your party. It's styled with their ancestral sigil, they gray wolf, along with the house name Stark, and the Game of Thrones logo to make it official. It won't make you an official bannerman, but it will firmly show your allegiance to the true great house of the North. Because, in the words of Lyanna Mormont, "The North remembers. We know no king but the King in the North, whose name is Stark." She might only be 10 years old, but we think you should take her advice, and of course make sure you pick up this HBO officially licensed banner to show off who you think should be king!